It seems like winter may never end, so it’s best to embrace it! Or in this case, head outdoors in a short sleeved shirt for 15 minutes to catch some natural light! 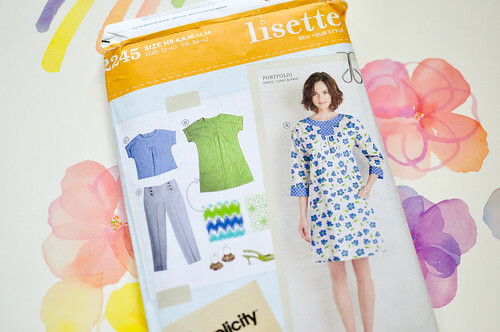 I have had the Portfolio Tunic in my pattern stash for a while. Amanda sent it to me ages ago but I could never decide which fabric to use and other patterns always seemed more pressing. Recently I spotted this Portfolio Tunic made by Allyson. (Thank you, Pinterest!) Immediately, I knew I had to make one and it had to be this sunny yellow Claire Aude print from Liberty of London that I had in my stash. Just the thing to cheer up some winter blues! I chose to do the short tunic to see if I liked the fit and the pattern in general, so I missed out on doing the awesome pocket detail with this version. 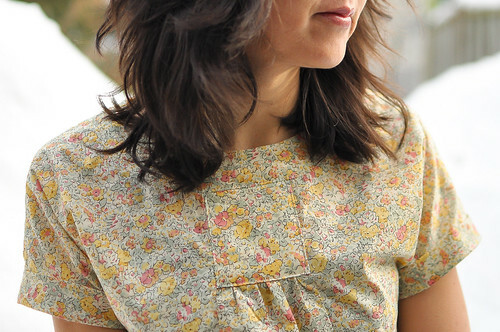 But I already have a next Liberty print set aside for my next version and it will be the longer tunic for sure. The pattern is a dream! Very simple, clear instructions and easy sewing. The front square yoke detail is so cute. The sweet two button closure at the back was the perfect place to use a couple of vintage glass buttons from The Button Dept. My only note would be that you need to really clip the seam allowance for the curve of the sleeve so that it sits properly. Unfortunately, this pattern is out of print! I didn’t realize it, but quickly found out as people started asking where they could get a copy. Luckily, Liesel Gibson commented on one of my posts that she is working on an updated version of this pattern that she’ll be putting out herself. Hooray! this is so darling! 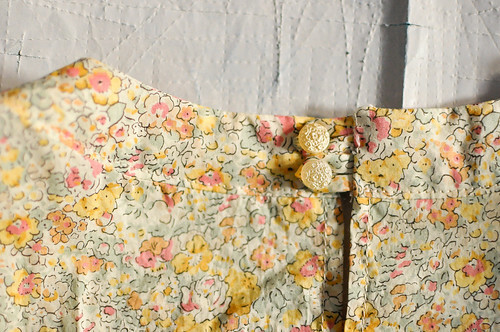 love the buttons and the pretty details! Lovely! I’ve had this patetrn in my stash forever. 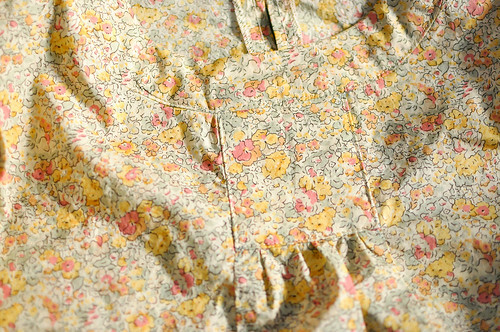 You’re making me want to sew it up, and in Liberty no less! It’s adorable Karyn! It looks great on you. This is so pretty and delicate! Inspiring! Your blog has been an endless source of inspiration for me – so it is quite an honor to see my Portfolio dress mentioned in your post 🙂 Yours looks great!! Allyson! Oh no, THANK YOU!! I was just so inspired by your beautiful version that I couldn’t get it out of my head. I’m so happy that I finally gave the Portfolio pattern a try.